A leading French surgeon says he has now effectively carried out a full face transplant after two operations in the same number of weeks. Professor Laurent Lantieri, who has performed three of the world's six partial face transplants, said every feature had now been transferred. In a lengthy operation at the weekend, a team in Paris transplanted the entire upper part of a man's face. Approval for a full face transplant was given in the UK nearly four years ago. Professor Peter Butler of London's Royal Free hopes to carry out a definitive procedure including the throat area and all of the scalp within the next 12 months. 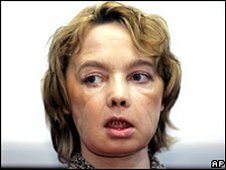 The first partial face transplant was carried out by doctors in Amiens in 2005 on Isabelle Dinoire, a 38-year-old woman who had been mauled by her dog. She received a new nose, chin and lips. Despite concerns that her body might reject the donor's tissue, she is said to have adapted extremely well to her new face - not just physically but also psychologically. Since then partial face transplants have also been carried out in China and the US. In the Chinese case, the patient - who had been mauled by a bear - has since died. Last year in Cleveland US doctors claimed the most extensive face transplant yet, replacing 80% of a woman's face with that of a dead donor's. Three other face transplants have also been carried out in France. At the end of last month, surgeons at the Henri Mondor Hospital in Paris spent 15 hours on the face of a man whose original features were blown off in a shooting accident. But in this latest operation this weekend on a 30-year-old man severely burned in a 2004 accident, doctors claimed to have broken new ground. As well as transplanting hands at the same time, the upper half of the man's face, including the scalp, forehead, nose, ears and upper and lower eyelids, were transferred - in what is understood to be a first. "Now that we have realised this part, there's not really much point talking about the full face transplant anymore. Technically it is done," Professor Lantieri said. "You transplant according to the patient's need." His team will carry out two more such procedures in the next few months as part of a trial which saw five operations approved. Once the results are reviewed, he says he hopes to see the procedure more widely available in specialist centres within the next few years. In the UK, Professor Butler says he has been approached by 34 patients who have expressed interest in a transplant but rigorous selection procedures had slowed the process down. "We have been working through the psychological issues of transplantation," he told the BBC. "Would this person have a significant difficulty with this type of change of appearance? The interesting thing with people with facial injury is that you have an idea of how they have already coped with facial change." But he also stressed that contrary to popular perceptions of people inheriting the faces of the dead, "you get is a hybrid, something between the donor and the recipient. What you get is more like the recipient than the donor". Professor Iain Hutchinson, an oral-facial surgeon at Barts and the London Hospital and head of the charity Saving Faces, said the debate about the first full face transplant had long been "academic". "The race is already won. The first face transplant was done by the French. The ethical boundaries have been crossed," he said. "But we have to remember that there are significant hazards attached to this - the side effects of the immunosuppressant drugs patients must take for the rest of their lives for instance. "The issue here remains that this is a huge operation - but not a life-saving one."